This week is officially referred to in the calendar as Great British Game Week and so I thought I’d share a little information and photos of another one of our local establishments that have game on the menu throughout the whole year. 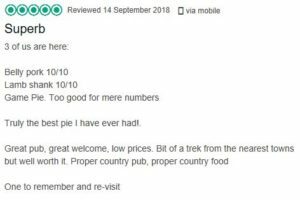 The Feversham Arms in Upper Farndale is a delightful pub owned and personally run by Rachel and Alan and provides it’s guests with the very best comfort and hospitality. 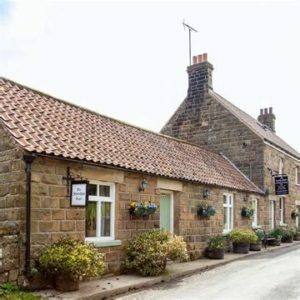 The Feversham is set in the picturesque surroundings of what is locally known as “Daffodil Valley” because of the stunning display of thousands of wild flowers each year (well worth a visit if you’ve never been). On the menu they currently have Game Pie which incorporates pheasant, partridge and grouse served with homemade chips and vegetables of the day (attached is a little trip advisor review, the Game Pie must be especially good, as it is too good for mere numbers more than a 10 out of 10). 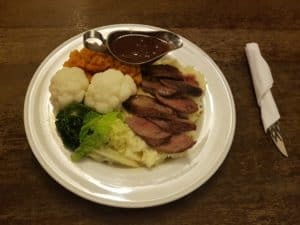 They also have current season pan fried grouse breast in a red wine & raspberry sauce served on a bed of mash potato with vegetables. 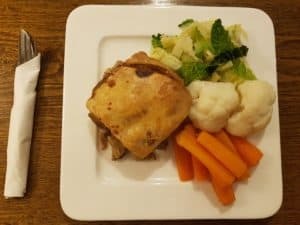 Should you visit at other times of the year you might be lucky enough to try some venison steak, homemade rabbit pie or a duck breast in an orange or plum sauce.